I've done my own research as well but can anyone recommend Batman and Robin figures that would be suitable for a dashboard? I've not found anything that fits my interest. That's to say not too big, maybe not so very small that they'd go unnoticed (But that's not a definite (I got the idea looking at the Heroclix in another thread.). ), not action/jointed nor with material clothing, not fragile/breakable like a sculpt, maybe but not necessarily with bases to putty them down, not stylized like Funko, Pop, Bendy, etc., and definitely with a really good TV series (faces even maybe) likeness and vibe? I thought about a Batmobile with the figures in it but that would likely be a little too much in multiple respects. What kind of car or more specifically, what does the dash look like. For instance, the nano figures with a magnetic base would work in a recessed area as on a Subaru Legacy/Outback. You can even make that a Batcave area. I found the Batman. Can't tell how big it is but it's the best I've seen so far, except I don't see a Robin(!)? 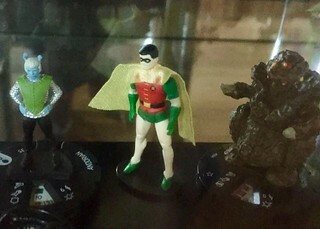 This Gentle Giant "Mini Superpowers" figure of Robin is in a similar scale (but is not in the "Nano MetalFigs" series). Thanks, S--do you know if the are they still being made--that Robin might appear? Not sure where you would place it unless you have a way of keeping them stationary. That's why I asked about ones with bases so I might be able to hold them in place with putty. And mine's a 2002 so a little different. Story is, for the third time in a few years, twice in the exact same parking space(! ), I saw a car (so three separate cars) tricked out in Batman paraphernalia--vinyl applications, hubcabs, Gotham license plate, etc. I don't want to do anything with the exterior, but I'd like to do something inside, and not sure what's workable, visible enough but still legal, etc., so my first simple thought was a pair of Batman and Robin figures on the dash. I thought above window clings for the back windows or windshield but searches yield only things described as stickers so I have to research more, Batcuffs for the rear-view mirror but not sure they exist in a toy-like/inexpensive version (though I have a page with a prop version saved but there was no price which is never encouraging...), etc. I'll have to start a thread asking if anyone here has his or her car done. Had seen that one, yeah. But only looking for the series version. Will have to do more thorough research when I have time. If you find your figures you can stick them to your dash with poster putty. I use it to keep a hot wheels Batmobile on my dash. I posted in another thread a few years ago, but I equipped my "Batmobile"—a 2015 Civic sedan— with the Diamond batphone coin bank. I had the phone on my desk, next to my Shakespeare bust, but it just didn't look right, so I found a plastic jar that fits snugly into my car's cup holder, and velcroed the phone to the jar lid. I also created a custom wallpaper for my car's media touchscreen, using a batmobile door emblem one of the members here shared some time ago. If anyone's interested, I'm happy to share the jpeg image.